Zombie Bib Green and Black by Bobines BobyAnne | The Arcade Archives! If your off beat like I am; you know its hard to find great greeky products for your kids or in my case my grandbaby! Bobines BobyAnne has amazing products to add some geekiness to your babies life! 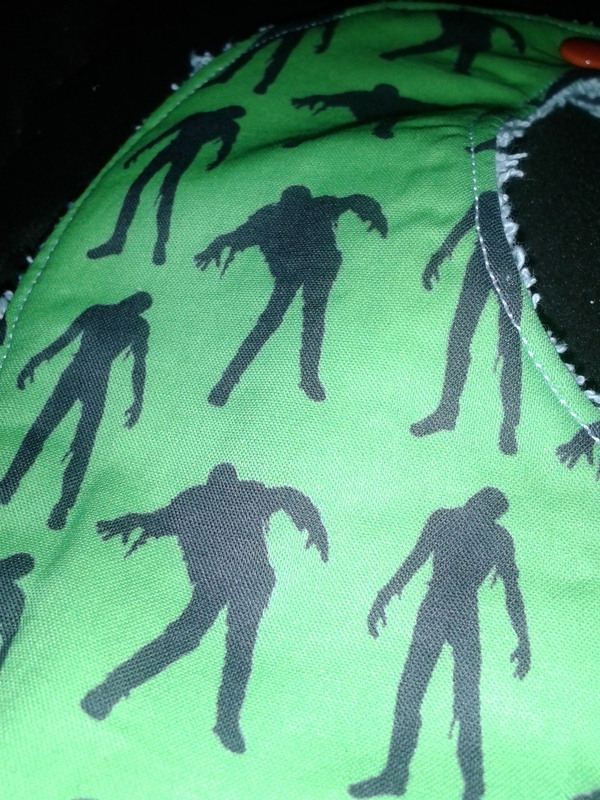 The bib that I’m reviewing has an amazing zombie theme to it. There is so much I love about it. The first thing is the size! I hate all these tiny bibs that you buy in the store this is a great over sized bib that even when he gets bigger he can still use it. I also love that it has an awesome pattern on the front but the back is a wonderful terry cloth fabric. Its a great duel function item. You have a wonderful bib on one side but you also have a towel on the backside to wipe their little faces with. 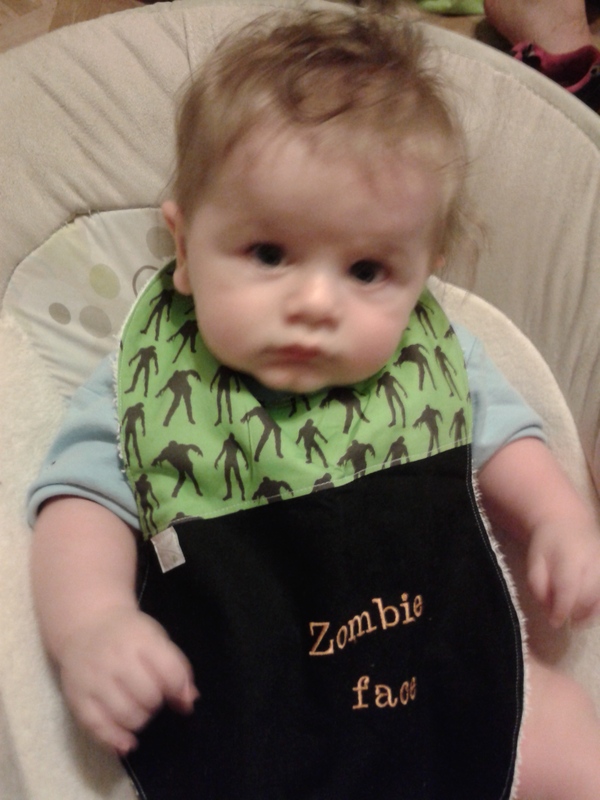 This is actually the best bib ever for Ash because I call him my little zombie baby! It is super absorbent as well. The coloring is fantastic. The green is a bright vibrant green which really pops against the black on the bottom of the bib. 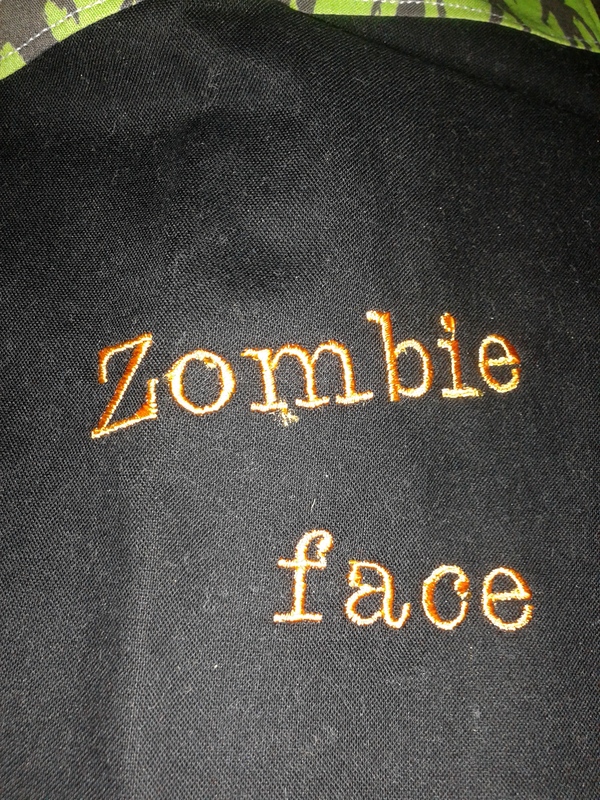 There is also fantastic embroidery on the bib as well. Of course there is also the construction of the bibs. The bib is beautifully constructed as well with tight strait seems. The snaps are also very secure. 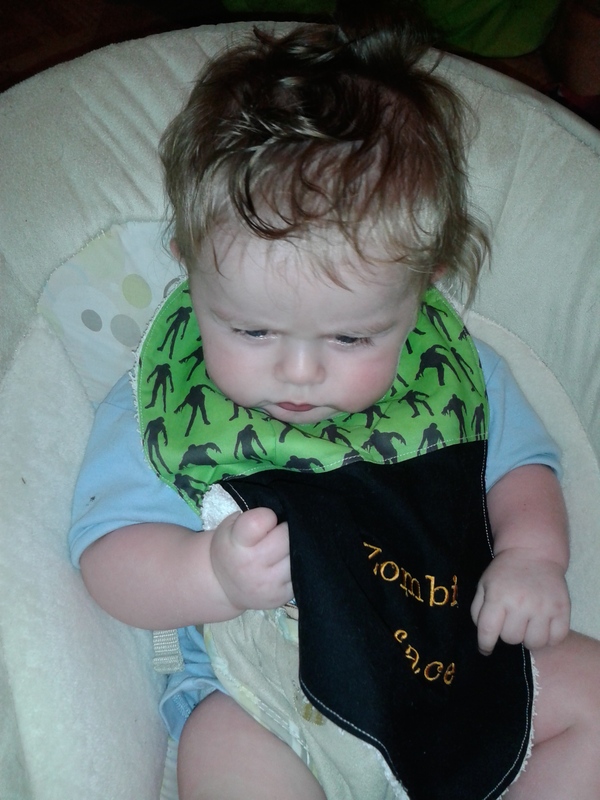 There is also two snaps so that you can put the bib on a bigger child as well as a smaller one such as Ash who is 5 months but loves his baby food. 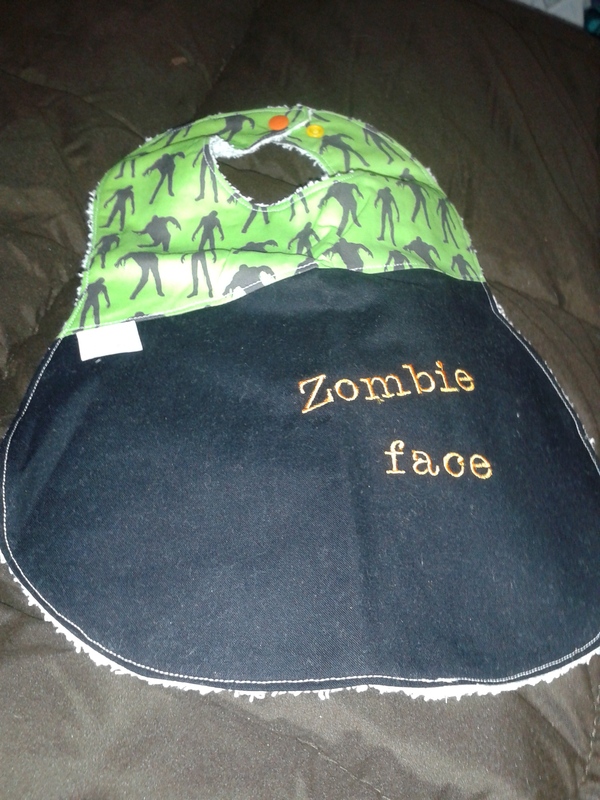 This awesome bib sells for $12.97, which is an outstanding price for the quality that you get and the size of the bid. Maybe you don’t want to put zombies on your baby well that’s ok there are plenty of other options. Some of the other designs are Nightmare Before Christmas, Pac-Man, Ninja Turtles, and Hello Kitty just to name a few. They also offer custom orders so if you don’t see what you want you can see what they can do. This entry was posted in Archive Entries and tagged bibs, handcrafted, hello kitty, nightmare before christmas, Ninja Turtles, pac man by ravenheather. Bookmark the permalink.